BC NDP leader John Horgan said his party, if elected, would create a Community Partnership Fund to upgrade needed infrastructure. Apr. 18, 2017 5:00 a.m.
'If you don't have at your core places where people can gather to grow physically, spiritually, culturally, you're not a full community,' BC NDP leader John Horgan said. BC NDP leader John Horgan announced today that, if elected, his party would establish a Community Partnership Fund to upgrade needed community infrastructure, like sports fields and tracks. The fund, which would invest $30 million over three years, would support the creation and upgrading of facilities for sports, the arts and seniors. One of the places that could be helped by the Community Partnership Fund is the North Delta Secondary School track, which is used by community members and athletes. “We need to make serious investment in infrastructure, and sport infrastructure in particular,” Delta North NDP candidate Ravi Kahlon said. Kahlon is a two-time Olympic field hockey player and grew up practicing at the North Delta Secondary School track. He said the track is currently “unusable” in bad weather. The Community Partnership Fund would be part of the BC NDP’s $10 billion capital infrastructure plan designed to take place over five years. It would be a joint project between all three levels of government and facilities interested in tapping into the fund would have to apply. “If you don’t have at your core places where people can gather to grow physically, spiritually, culturally, you’re not a full community,” Horgan said. Horgan made the announcement from Kahlon’s home in North Delta. 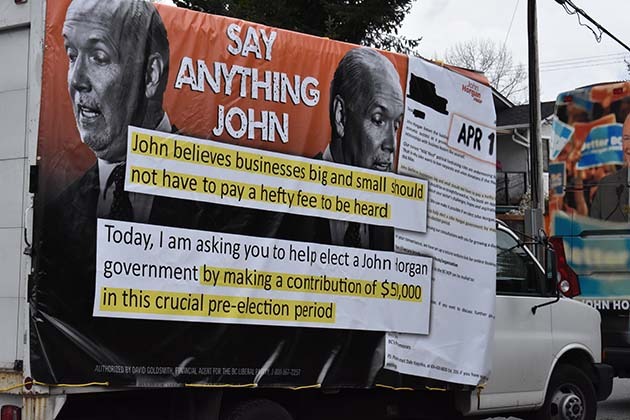 A van sporting a BC Liberal-sponsored ad against Horgan was parked outside. When asked about the van, Horgan quipped “it’s my view that the BC Liberals have more dollars than sense.